GB Pockit Stroller is a Guinness World Record Holder for being the smallest stroller in the world. Previously the title was held by the Babyzen YoYo, but the GB Pockit Stroller has held on to this world record title for two years. Perfect for holidays, especially if you’re flying as it can go in the overhead locker or under the seat. 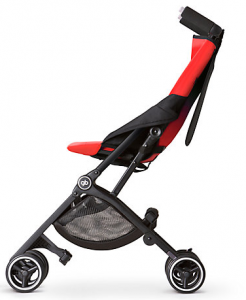 The GB Pockit Stroller is available to buy today at John Lewis, plus 1.5% KidStart savings. The Pockit stroller most definitely requires a two handed fold and unfold, but the advantages of its size and weight far outweigh that small problem – how often do you see a buggy that can fit in your handbag?! To unfold: take the pushchair out of the box and release the manual lock, then push the two white buttons on the handle. It takes a little practice but soon, you will be able to shake it down and open, whereupon it locks into place. Lastly, click out the rear wheels. 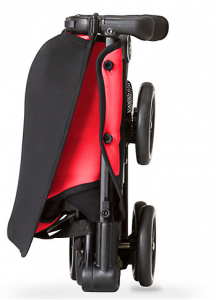 To fold: flip back the hood of the stroller, then push the white buttons on the rear wheels and fold the legs in. This needs quite a firm push to click them into place. Next, push the buttons on the handles, push in and down and it collapses. The speed and efficiency with which you can do this improves with practice. It might be rigid at at start, once it’s out of the box but will become looser with use. The sides fold in and you can secure the manual lock. The GB Pockit Stroller is available to buy today at John Lewis, plus 1.5% KidStart savings. The seat is simple and suitable from six months up to about 24 kilos (that’s amazing) and has a fairly roomy seat with a high canopy, that is 60 cm above the seat back, so good even for quite tall children. There is a piece of fabric at the top which attaches to the canopy and which acts as a soft, hammock-like head rest. The fabric on the seat is removable and washable so it should last well and continue to look good. Is small and flat. Not really a hood, but it is good enough for keeping overhead sun off your kid. It folds back out of the way when you don’t need it. Inside the seat is a five-point harness which is fully adjustable by threading the straps through the buckles at the top of the child’s shoulders. Un-pop the chest pads to gain access and they adjust chest and waist straps at the same time. Clicks together and all you need to do is push the central button to release it again. There is also a crotch pad for added comfort. There is no leg support but there is a soft plastic foot rest which older children can use. Sadly there is also no recline function on this seat. Therefore, it’s not suitable for the under six month olds and you may not want this as your only stroller. Your child may be uncomfortable taking naps in it but as an additional run-around and of course for holidays, it’s perfect. It comes in Capri Blue, Sea Port Blue, Posh Pink, , Lizard Khaki and Black and John Lewis also has an exclusive colour, Dragonfly Red. The chassis is sturdy even with its small, compact and lightweight frame. The handles are forward facing. You can’t really push this stroller one-handed. However for a travel buggy, this will not be a disadvantage. The handles are height-adjustable to two positions, 93 and 99 cm. Might not be most comfortable for tall parents but practical for most. The handles are foam covered for a comfortable grip. 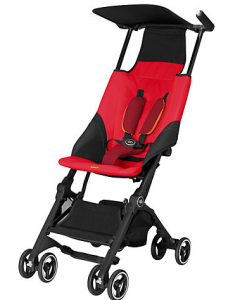 Due to the compact size of the stroller, you would expect it to have small wheels at 11 cm. This is an advantage when it’s being folded and stored but may cause issues on very bumpy ground. However, on normal, flat pavements it will be as manoeuvrable as other strollers. The front wheels can swivel to help with tight corners. If you do encounter a rough patch, lock the wheels for added stability. The Pockit has a one step brake. Push it down with your foot to engage and then push it up again to release it. The stroller also features a small basket for baby essentials. It’s best to access the basket from the back and you can add a medium sized changing bag into it.